On occasion I have pondered what I would compose for the last post here. I have never gotten around to writing whatever it would be, and this is not that post. However, circumstances are that content here will be quiescent here at least indefinitely. One of my many avocations will have me more than a few time zones away for the time being (my friend, the late Clarke T. explains). For reasons both practical and otherwise I will not be posting until I return. In that this could be a relatively short period, we will have to save the long goodbye for another day. Just didn’t want anyone overly concerned if they find the content here becoming a bit stale and I hope nobody suffers any withdrawal. I suspect I will be a bit too busy to suffer withdrawal myself. This does give me an excuse to say what has been a latent thought for some time. I truly appreciate the readers that seem to have accumulated here over time. The unique daily user count here ranges between 250 and 500 depending on the mood of the blogosphere and the exogenous news cycle. I presume some more read via content aggregators of one form or another that do not get caught in my metrics. When I started, it really was not with much intention of building an audience. In fact when I began it was almost as a closed invitation-only type of blog. I really didn’t quite imagine more than a very small number of folks would want to read my musings on all things Pittsburgh. So now, 2,425 posts later, if I were to write it over again I don’t think I would change anything I put in Post Zero explaining my motivations here. What has changed is that I have been heartened many times by the realization that engaged folks do read here and it is possible to have a meaningful civil discourse that goes beyond the superficial. Or, as Potter once put a bit more eloquently, Discourse Without the Dis. With that, I am sure the conversations will continue unabated. For all the angst over what blogs are, or are not, are they truly no more than an expression of, and similarly motivated by, Adams' long ago decree: "Let us dare to read, think, speak, and write." Carry on! Hard to be the bearer of good news in this town. This is something just out and quite honestly I am surprised. If it holds up over next few months it is pretty big economic news. 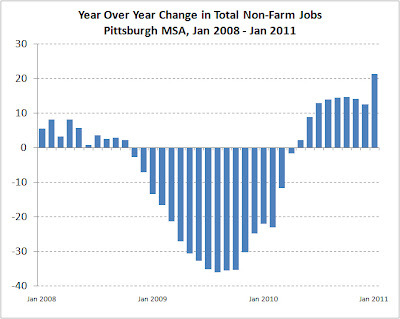 You can check out the latest dump of total non-farm jobs for the region from the BLS here. I have done absolutely nothing other than calculate the year over year change over the last 3 years. What is interesting about the January data just released? Like I said.. if it holds up. January is still a preliminary number, so something to keep an eye on. I guess I am just lucky they just didn't label it all 'unctuous bafflegab'. It really does kind of read much the same as Mr. Brock's sublime, if ad hominum, wordsmithing on much the same topic. Both arguments are just curious to me in that most of the folks Downtown take issue with me for being far too pessimistic all of the time. Strange little bubble that I live in it is. If I have any quibble at all with it is that I tried to explain that not all population loss is the same, that the natural population decline induced by our painful history and odd demographics means something quite different from the proverbial 'young person' fleeing the region. Over the course of the entire 2000-2010 period Pittsburgh remained solidly the only large metro region experiencing more deaths than births. I've struggled for a couple decades now with how to say this in a clear, yet uncallous, way: Policy can't stop us from dying and it would not help if Border Guard Bob chained our seniors to their beds to keep them from departing. Since the editorial was mostly an expression of sentiment, there isn't much counterargument. I guess the general argument is that since the top line population trend for 2000-2009 is actually worse than what you saw between 1990 and 1999 then things must be worse. I get the logic... for a moment. Here is a compilation of a couple numbers that for the record are not mine. The Gnomes at the Census Bureau compile the components of population change and here I will present what they say for the 1990's compared to the recent decade. Again, that data is not mine, but from the Census Bureau. The only complex mathematical formula here is my extensive use of addition. So if your metric is 'voting with your feet', the net migration number for the last decade is less than half the decade before. If the last year was added in (data not available yet), I bet you the comparison would be even starker in that the net migration numbers are likely positive these days. I could parse further and argue that if one could take out elderly migration you would see an even starker shift since retiree migration is relative consistent, and for us always a net outflow, year over year compared to the migration of younger workers. We will skip that discussion for the sake of parsimony that is already lacking here. For history buffs, if I were to do the same calculation for the 1980's the net migration bar would stretch down to around -230 thousand for the decade. Then population loss would have been even worse except we still had a decent rate of natural population increase. But things are still getting worse!! OK, time to breathe and move on. SIC SEMPER NUMERO. * No, not really, but I sure hope they have forgotten my comments on Evergrey-gate. For those who are quibbling with my miasmic look at City of Pittsburgh population trends (gee thanks Tim); it may be worse than even I was thinking of when I wrote that. I apologize if others have noted this, so much Census chatter all around. If you look at the population under age 18 for the city, this is what you get. If that does not shock you. Keep looking at it until it does. Why is this really important? The overall population loss in the city masks some other things going on. Namely I think all would agree there has been a net gain in college enrollment and student residents in the city. So the loss in the remainder in the population is higher than the top line number would have you thinking. The population under age 18 is a decent proxy for what is going on in the household population in the city of Pittsburgh. For everyone who has been asking me what it all means: yes. no. maybe. We (the royal we) will be parsing all this for decades, but here is what I take from our first look at yesterdays dump. First off I have to say I still find it hard to explain how folks misunderstand the geography of Pittsburgh. Folks will say “Pittsburgh” when they mean the city, but be referencing some factoid about the region or vice versa all the time. We make ourselves more confused than we need to be. 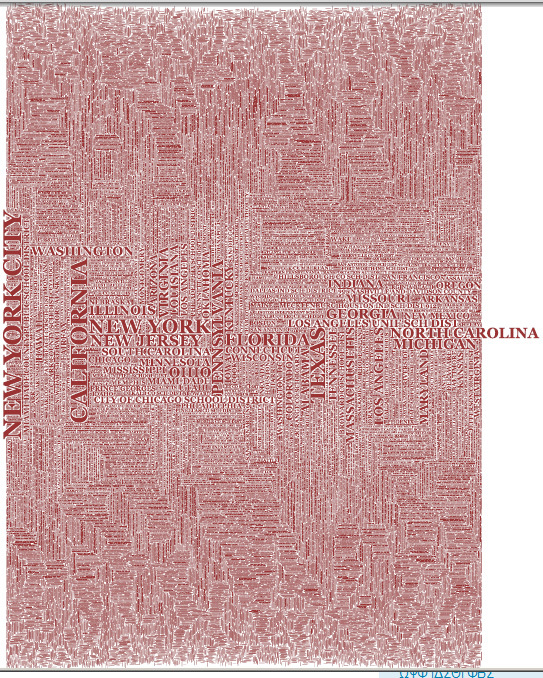 Let's call the region "Northern Appalachia" if that clarifies anything. Also. I think everyone who has talked to me, or that I have heard elsewhere, has been completely misusing the term ‘inflection’. As in the region has reached some inflection in its population trend. For things like total population and net migration we are parsing when decline has become an increase. That isn’t inflection. A literal reversal of rate is when the first derivative is zero. Inflection is when the 2nd derivative is zero. I think ‘inflection’ sounds like a much cooler word so it becomes over(mis)used… but it really does mean something pretty different when analyzing trends. OK… beat that for esoteric rant. The 2010 numbers are coming in a bit ahead of where the estimates had us. Not by a huge amount, but if you have been parsing when the migration turned positive then it is a big thing. For the most part, records of births and deaths are pretty accurate, so if you see a difference from the annual estimates with the 2010 enumeration, it is mostly going to be coming from errors in the migration estimates over the decade. Before we officially learn the latest numbers, net domestic migration for the region turned positive with 2008-9 data. Including international immigration overall net migration for the region turned positive the year before that or 2007-8. With this new 2010 data it is likely the turnaround in net migration actually reaches back to the 2006-2007 data. Take that for what it is worth. Also came in ahead of where the estimates had us, so as with the region, the net migration has likely been a bit more positive than the annual estimates have been showing. I find a bit interesting, if coincidental, that the positive discrepancy in the county’s numbers vis a vis the estimates trend are nearly opposite in magnitude with the discrepancy for the city proper. More on that….. There is not a lot good in the numbers. I know some commenters here have been suggesting in the past that city might have had more growth (or less decline as it were) than we were expecting. For the numbers to come in well below where the estimates trend had us pegged is pretty bad. It’s been pretty clear to us that could not be the case. 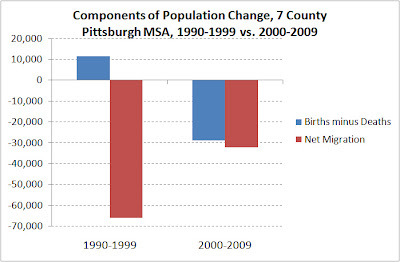 Too many Pittsburgh neighborhoods are depopulating. They just happen to be neighborhoods that a lot of folks just never go see. If you have not been in Homewood in the last decade, go visit. Beltzhoover, ditto. We are talking as severe housing vacancy and abandonment as exists anywhere. So if you think there are more people living in the city, you have to ask yourself where they are living. On the holy grail of Downtown living. I’ll skip the long story, but if are looking at the Census' data for Downtown in 2000, the data you are looking at is generally wrong. The short version is that the Census Bureau forgot to move the location of the jail in their data. So for 2000, the Downtown population appears to have roughly 2,500 (the inmate population of the jail at the time) too many people. If they were place in the Bluff where the jail now technically resides, the population there would be much higher. Since they got it right this time around, you have to be careful what you compare. The 2000 downtown population was 4874 (per the SF3 number… or 5222 per SF1). If you took out the 2500 jail population you get a remainder between 2,500 and 2,800. So with 2010 we are seeing a Downtown population of 3,629. So it looks like the non-jail population residing downtown has indeed gone up by somewhere between 800 and 1,200. Growth for sure and certainly a big % gain. I’ve had this Groundhog Day like conversation for many years with folks saying the Downtown population will be the catalyst for overall growth in the city. It just isn’t possible for any conceivable gains Downtown to begin offset losses in so many other neighborhoods. If we had 10 Downtowns like that I suppose, but we can’t afford subsidizing that many condos I am pretty sure. Braddock came in with the steepest population loss in the county. There were a few municipalities in Westmoreland that had slightly larger percentage decreases, but Braddock is now pushing down near a population of 2,000. Not sure what else there is to say. Big losses elsewhere throughout the Mon Valley as well which is only remarkable in that it is now at least 20 years where everyone has said that the redevelopment of the Mon Valley is one of the priorities for the region. Whatever it is we think we have been doing, it has not impacted the trend much. If the counterfactual is worse than this for these communities…… I can’t finish the sentence. and with all that.. there really are other things to talk about. Not that unexpected, but here are the Pennsylvania State House Districts that have seen the largest population declines between 2000 and 2010. All of the top 5, and 8 of the top 10 are from Allegheny County. All 10 are from the Pittsburgh MSA. Below is the top 10 list. The full list is an excel file I have online here. Census 2010 results for City of Pittsburgh neighborhoods online over at the Pittsburgh Urban Blog. .... where is Hank Williams Jr. when you need him? This will be a living post for the moment. Census dump is online here (and the Census' crib sheet excel file summary is here). Short version so far: County better than we thought, city worse by a decent % chunk. 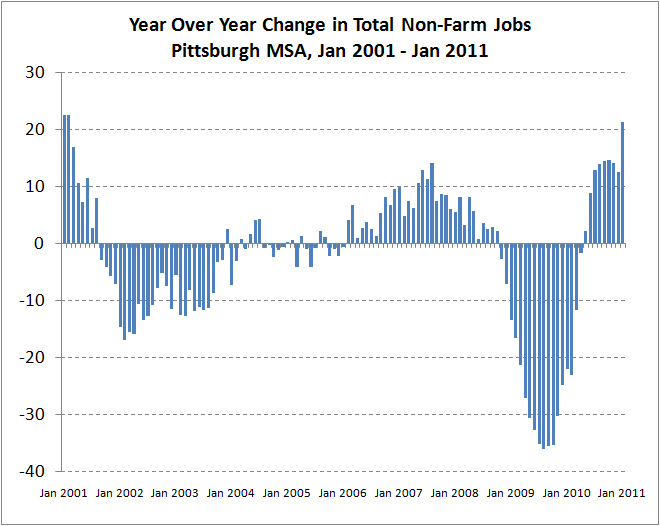 Pittsburgh region (MSA) is up just a bit percentage wise, but mostly where expected. Fayette has the biggest loss compared to the estimates and Westmoreland is the most above where the estimates had it pegged. Note that if you are comparing MSA’s between 2000 and 2010, the definition of the region changed over that time. So you may be looking at a 6 county region if you are comparing populations. There is always the pre-game. So before check the census numbers about to be bestowed upon us... it is good to look at what we think we know. Here are past data points for the total populations of the city, county, region and state and what the latest estimates for each tells us where we think we are. This is what will be worth comparing to the numbers when they come imminently. or 2pm they say. 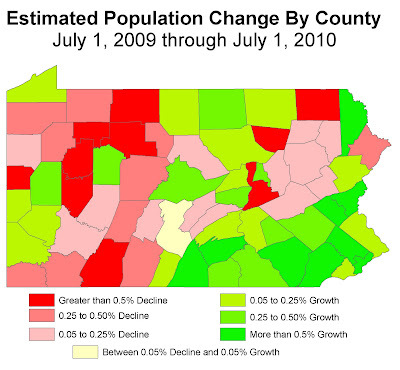 Just more on the county population estimates released yesterday; also that were discussed yesterday here. I don't have time to get into what this is telling me.. but let's just say I'm not seeing it. A little maybe, but just in some very localized places. Anyway, this is what I get when you map it out the most recent growth being estimated across the state. I suspect Ken is mad at me for never getting around and making note of some good news at the airport. It is old news now, but a few months ago it was announced Delta's Pittsburgh to Paris flight will expanded to 7 days a week beginning in June. A good thing, though peak summer season is not the rub. It is potentially a good sign when looking to see if they continue the flight without their seminal subsidies provided by the ACCD and the state. It goes along with today's news that Delta has the Paris flight on their fall schedule, though I am pretty sure that isn't new news either as you could book through October since the beginning of the year. As to whether the flight really does stick around unsubsidized? The latest word is they will let us know in late spring. There must be some angst that it will not happen, or else there would not be the big marketing push. It really will be a big turnound for the flight if they go from taking in the maximum subsidy to being willing to sustain it at free market prices. Given the news everyone expects today about the state budget being slashed, it seems unlikely the state will pony up for their part of that deal next year. Here's my big picture question. Let's say it works and Delta keeps the flight. Will other regions start competing with others via subsidies to airlines for flights they want? This all could become the paradigm. Airlines would love it I guess. Speaking of the ACCD... former ACCD CEO Michael Langley seems to have landed a new gig in Minneapolis St. Paul. How about I make it up to him with more good news mostly unmentioned here. This counts as our daily metric as well. Looks like few have noticed that the airport was counted as the 7th best airport by Conde Nast Traveler's 13th Annual Business Travel Awards poll. More interesting that that version of the story comes from Youngstown. So a Cleveburgh story as well. More interesting news to me at least, but Pittsburgh is one of a set of airports recently granted new licenses to fly direct to Cuba. If only that could help the Pirates recruit up and coming talent. and for the uber geeks among us.. Delta is looking to add electronic charging stations out at the airport. and while this story made the rounds for its sheer curiousity... I swear this is a Marcellus Shale story unto itself: Continental flight delayed by 3 hours because of broken toilet. I will bet that Houston has had the biggest percentage increase in flights direct to Pittsburgh over the last 2-3 years. Between the flights of all the itinerant works and the likely drilling on all the land they have out there, I would say the airport is potentially the single biggest benefactor of Marcellus Shale development in the county. So just to confuse even the most wonky population data folks out there, here is another datapoint to think about as we await the deluge from the 2010 Census. The Census folks just dumped out the county estimates of the 2010 population. Seems a bit silly when we are about to learn the more authoritative numbers from the decennial census itself. But these are important for 2 reasons, they help us understand the decennial numbers because they provide a baseline for comparison with where we thought we were. They also provide year over year data that is pretty important to understand the trends you miss if you just look at data points 10 years apart. For those who know all this, they didn't release the full dataset on the components of change. So I can't yet explicitly update the datapoint from last year that showed we had positive net domestic migration for the first time in decades. They just released total population counts. The headline factoid that results is that all in, the Pittsburgh regional population actually ticked up between 2009 and 2010. A very small tick... a very very small tick, but hey it isn't decline. I think that may be the first overall increase in the regional population in decades (I'll figure out that historical factoid when I get a second). Given that the natural population trends (births and deaths) I am quite sure is showing continued net decline at this time.. it must mean that the positive net migration trend has continued.. at least as far as this data has us believe. So to be absolutely clear.. these numbers have nothing to do with the 2010 decennial data we are about to get.. Our view on all this may be very different (in either a positive or negative way) in literally hours. Still, no matter what we get for an actual 2010 population count, these estimates data say more about what has been going on year by year over the last decade. I have to point out that the trend should not be a surprise. Update: OK, before we get too too carried away. The census estimates do say there was a period of overall population growth for the 7 county region between 1991 and 1994. Still, there is a big difference between now and then because back then there was still overall natural population gains each year. So now there must be enough net migration to offset that. 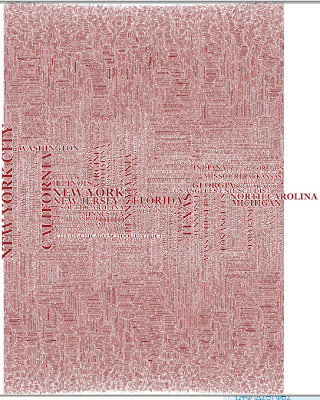 Local government wonks should not miss the NY Times magazine's omnibus look at the fiscal crisis going on in governments across the nation: Broke Town, USA. There is an obligatory mention of pseudo-bankrupt Harrisburg in there, but the more explicit talk over what the continuing Chapter 9 bankruptcy of Vallejo, California means. The scary thing remains that no matter how we want to look at it, the fiscal state of the city of Pittsburgh is far worse off than Vallejo ever was, is, or will be well into the immediate future. But on the topic of local governments everywhere, and while we are awating the deluge of census data for Pennsylvania to be dumped.. here is something fun. Analogous to the graphic I did for Pennsylvania, below is what the same thing looks for the entire nation. All the governments in the United States. Roughly 90,000 in all. Again scaled by the number of full time workers employed by each. The low res version below can't begin to come across; you can download the full PDF file which has much better resolution. Warning it's a 50mb file in itself. Because of the NYTimes article last week there is heightened new interest across Pennsylvania over radiation in the fracking water being used in Marcellus Shale development. Just saying that we mentioned the whole radiation in shale issue here just over a year ago. So clearly some folks are not surprised by this. So why is this news all of a sudden? Someone was not thinking ahead. Which isn't to say I have any insight into the scale of this as an issue. If anything I am geology challenged, but it should highlight the real problem of radon in Pennsylvania. I still wonder a bit when someone will float the idea of mining for uranium in Pennsylvania... or potentially even refining the shale itself for uranium. But my old post was just pulling something from blogger AtomicRod who in addition to talking about all things nuclear has brought up what may be the real underlying debate over the impact of shale gas development worldwide. We are the nexus of the biggest energy cage fight that is emerging. Some have framed the debate over the future of energy in the US as between nuclear and natural gas. The future will not be absolutely one or the other, but clearly there is a lot of marginal investment that may go toward one or the other dependng how the economics of the two energy sources evolve. Before the escalation of shale gas development, nuclear was beginning to reawaken as we all know from Westinghouse's expansion locally. Is the development of Marcellus Shale, and other shale gasses, putting that at risk in the future? This literally just popped up. From Arkansas: 2 firms to suspend earthquake zone injection wells I do wonder if the MSC folks have a PR already prepared just in case one of those occassional Pennsylvania earthquakes occurs... The header would be "Not our fault!". And I was on the turnpike yesterday and noticed a pro-coal billboard that I had never seen before. It was kind of remarkable.. It said something like "Wind dies. Sun sets. You need reliable, affordable, clean-coal electricity." Like really? Now the sun setting is cause for concern? That or I should go start the portable generator every time the wind peters out? I sense that ad it really a reflection of some angst in the vast PA coal industry over shale gas. It may be an even bigger food fight impacting shale gas in the future actually. In terms of net job creation, if natural gas does grow as some say it will, what does it say for the future of the coal economy in Pennylvania? Here is a headline... all of the states bordering Pennsylvania are listed among Intuit's list of the worst states for business tax laws. Funny that... you listen to the talking heads and you would be sure Pennsylvania was the very worst place in the world for business taxes. I wonder how we compare on personal income tax rates? Or sales tax rates when compared with our real competitors which are our neighboring states. It says 'next week'.. so I expect early in the week. Then we can all obsess on what the numbers all say. We will learn things like.. How many people really do live in the City of Pittsburgh? How much has East Liberty shrunk in the last decade? How many folks really have moved Downtown and how few folks are left in Braddock? That should round out the first wave of headlines, and then we will go from there. Then there are the redistricting gnomes that can really go enter the zone for the next month. If two bureaucracies flail at each other on letterhead, do they make a sound? Hey, at least the poor beat reporters show up for those ICA meetings. At issue appears to be $13 million the ICA is withholding from the city. Who knew? The issue seems to be the city's lack of cooperation in a nominal agreement to merge its accounting system with Allegheny County's accounting system as a cost-savings measure. The city wants to instead merge its accounting with the unerring financial wizardry of the Pittsburgh Water and Sewer Authority (PWSA). Maybe I mean sophistry? Unmentioned is some of the odd story behind the PWSA's own accounting system. Mentioned here 6 months ago, was some passing news that the PWSA wanted to ditch its use of software from SAP (that would be the largest business software company in the world by the way), for a company with 1/10th of 1% the number of employees, and it seems an even smaller proportion of experience in this market. Beyond the elusive logic of that, remember the city fully supports city-county consolidation.. something that getting some synchronicity between the two governments' accounting would necessitate. If the PWSA software does subsume the city's accounting systems, I just can't imagine what that Malaysian company will do with parking tickets that get sent out.